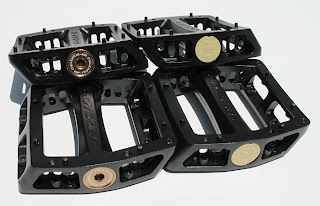 Odyssey's Way-better-than-Jim-C-Jim-C-pedals the Trailmixes are now available in light 'n' pimpin' magnesium flavour. 17.2oz for sealed, 17 flat for unsealed. So yeah, in short: Silence > Weight = Sealed. Silence < Weight = Unsealed. Simple! 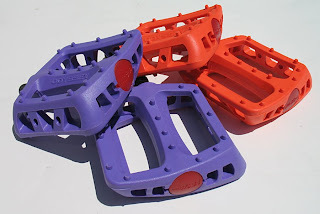 The other picture is obviously of the Twisted PC pedals in purple and fluoro red, 2 of 4 ltd. edition colours that are about to drop. My Twisteds are pretty old now, and still work fine, so yeah - a pretty good investment. The Boneyard, a fun park up near Chester (Oh-so relevant to Southampton, but you never know...), has been given a bit of a face-lift - check it! 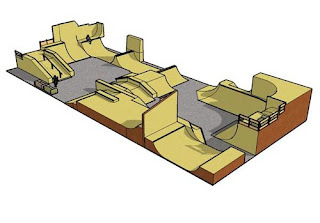 In other skatepark news, Newport was being given a facelift last time I was there to change the pyramid hip setup into a more diverse strizzeet section (For all the fruitbooters to sit on, instead of the funbox, no doubt...). Although that was an immense downer to me as all I wanted to ride was the bank->wall and aforementioned pyramid hip setup, it's still all good 'cos it'll be better in the long run. At least that's what I kept telling myself. £10 to get snaked a lot and ride a pair of pallets in some glass infested wasteland was probably not the best value for money ever, but there we are. Win some you lose some. Anyway, yeah, it's a bit more fun to ride than Motion (In so much as it's more than just a set of minis with a comp-fest going on into the foam), so if you've got enough people in the car to make the Severn Bridge Toll viable, head over into Welshland and get involved. It's a fun park, and the lights are re-done so you can see where you've going without night vision goggles. Laaaaaaaaaastly, Street Vs. Tweak 2008 is pencilled in for 7th June. I don't think I can really express how important it is for you to go if you're from Southampton. I mean I'm going there, and I live some distance away, so if you're a 10 minute roll away, you should probably man up and get down there. It was a good time last year, and with the combined might of Street Dave and Project5 (Who's Lynched in Leicester jam ruled, so they know how to put on jams...), it's gonna be unstoppable*. **But even then it'd probably still be good.